Where Has Jesus Been For 1900 Years? 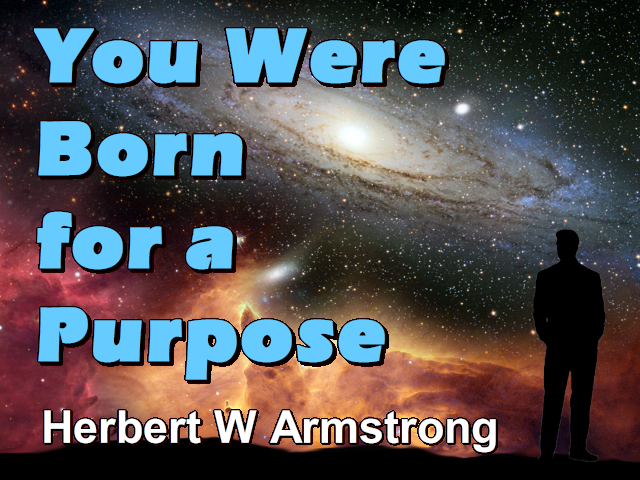 Well greetings friends, this is Herbert W Armstrong with the good news of the world tomorrow. Listen — do you know where you are going? Do you have a real goal, a purpose in life? You were put on this earth for a purpose. God Almighty planned and designed every detail of everything that exists on this earth, and that includes you. Bringing many sons of God unto glory! Jesus was glorified. Yes Jesus Christ after He rose from the dead He ascended to heaven and He was glorified. Here is the way Jesus looks now. Like the sun at full strength, no fog, no clouds, no anything in the front of it, no smoke glasses anything - full strength. That is the way Jesus is — He is glorified. My friends, He is the first born of many brethren. We are to be glorified with Him. What is man that God is mindful of him, what are you that God would be concerned about your life? My friends, you were put on this earth for a purpose. Now you may have some lesser goal in life, some goal of your own. But I want to tell you that if your goal is any less than that that God set for you - the purpose that He put you on this earth for, you are making a miserable waste of your time. Here we are most of us going along unconcerned from day to day just whiling away our time; just trying to well, let the fleeting moments pass some way to get this life over with. We don't want to die and yet we try to just go along and get the life over with, with anything that passes the fleeting moments in the most pleasing way we can. Of course we don't want to have pains and aches — we don't want to suffer. We want things to be pleasing, to be amused and entertained. And I suppose that one of the most pleasing things now is when we sit in front of a television set in our home to be amused and entertained; to have our minds go blank or just be carried away into a dreamland. Whatever the show, wherever it's taking us, whatever it's putting into our minds, we go along with it. In some fantasy some dreamland — not using our minds not thinking. There our eye is being appealed, to our ears being appealed to, there's pretty music going along with it usually. And maybe some of us do at home like so many do in the moving picture theatres, sit there also exercising the sense of taste with a bag of popcorn; chewing away. Or if you listen to a lot of the commercials, maybe you have a glass of beer or a glass of wine you're sipping away at while you look at it; appealing to the sense of taste as well as to the sense of sight and the sense of hearing and being very comfortable so far as the sense of feel is concerned in your easy chair. Yes just being pleasant while your mind stagnates and your soul shrivels up. That's the way a lot of us are wasting time today, TOO MANY HOURS OF IT. Course a certain amount of time spent that way on something that's practical; something that's important; something that's valuable; that is educational; that is doing you good; that's another matter. My friends, you were put here for an important purpose. Your time is entirely too valuable to waste in that way. And a lot of people don't know what that purpose is. They don't know where they are going and they don't know the way to salvation. You were born for a purpose; you should have one goal in life. There might be other lesser goals as long as they are compatible with it and are going to help you along to the main goal; but there's one main goal in your life. And someday you are going to regret the fact that you were ever born, if you have any other goal and unless you wake up and are working at this thing — at this purpose for which you were put on this earth; and working at it continually every single day. Now the apostle Paul summed up and expressed that purpose. I read it to you in the preceding program of this series. Philippians the third chapter the eleventh on to the fourteenth verses, inclusive, where he talked about "if by any means I — himself — might attain to the resurrection of the dead." Oh I wonder if you realize, my friends, as the wisest man who ever lived said, that man's days are just like the grass. Fleeting moments, we are here today, we're gone tomorrow. "If by any means I might attain to the resurrection of the dead [then you're alive for all eternity]. Not as though [Paul said], I had already attained..." (Philippians 3:11-12) That is to this resurrection — to entrance into the Kingdom of God — to salvation. Oh, so few people know what it is. So few people realize Jesus was just the first born of many brethren and that we are to be like Him. And I just described to you a few moments ago what He is like now. He is in the family of God and we are to be His wife. He is the husband and there is God the Father, it's a family relationship. God is a family — the GREAT family, the creator family, the divine family — the God family. The God Kingdom - the Kingdom of God. My friends you were put here to be born into it — that's what you were put here for. Until you learn how to use your life to make it so satisfying, until you learn how to use your life to make it oh, just abundant in happiness and in joy and brim full and running over, you'll never be given eternal life. God will only give you eternal life if you will learn how to live that life in the most happy, the most joyful, the most satisfying manner that there is. Talk about that, that satisfies, that that's good for me and good for you and that, that you can take with a smile; oh my friends let's get away with cheap commercials on a lot of poisons and things here on this earth. And realize there is only one thing that will satisfy and satisfy for eternity that is best for me and best for you. One thing that will really put a smile on your face and keep it there everlastingly for all eternity and that is if you know God's purpose and if you yield yourself to it; to let God accomplish that purpose in you. My friends God is not only the Creator, but God is the ruler. God is the sovereign ruler over all His domain, all that He created. Yes God has just ruled that in this time now we must choose. And we can choose to disobey Him and if we come under His government to let Him rule us that we may have the benefits of it and we have to do it voluntarily. Otherwise we can reject it — we can rule ourselves and suffer the curses of it. God commands us to choose, but He says choose life. But the fact He says choose means He made us so we make the decision. He will never make it for you. During a thousand year period after the second coming of Christ at the time of this resurrection and for a thousand years thereafter, my friends, there will be mortal people and mortal nations here on this earth. But they will not have their own governments and they won't have any despots, they won't have any dictators over them, it will be the divine government of God. And Jesus Christ will be here; God is sending Him to rule this earth. Every nation on earth and you and I, if we will yield ourselves to God and His government now, if we qualify we will be given power over the nations as lesser kings under Christ. That's to His true church. And we shall rule the nations of this earth with a rod of iron. God is ruler and we shall enter the very family of God if we attain to the resurrection. Oh, my friends, if only we could understand it. Now I think we got further, I think we got to one more scripture in the preceding broadcast. Yes I know we did. I Corinthians 6:2-3 where Paul said; "Do ye not know that the saints shall judge the world?" (I Corinthians 6:2-3) We are going to judge the world. Now in God's plan of government, my friends, the executive and the judicial branches are both under the same head. In the United States form of what we call democracy, that's rule from the bottom up of the people. That is the exact opposite of God's form which is rule from the top down, but it is divine rule of God Almighty. Now, I wouldn't want any rule from the top down if it is human rule. But when it is divine rule, that's a wonderful thing. When we have human rule it is a pretty safe thing to stick with the very form we have in the United States because I would rather, since there is so much selfishness. The majority are going to perhaps look after a little more likely, if they have the wisdom to do it, look after what is for the selfish interest of the majority instead of the few; that might be better for most of us. But how much better it will be when it is God's way. Well in the United States form the executive is one department, the legislative another, and the judicial is the third branch; we have three branches. In God's government the Father is the legislative and He is the head and there the legislative branch or the law maker is supreme and superior over the executive; as the Father is supreme and superior over Christ. But He has delegated to Christ the rule and placed the executive branch in the hands of Christ. And also the judging — the judiciary branch. In other words if we don't get some practice now, how are we going to know how then? Of course he is speaking here about judging in the church instead of taking matters to the courts of this world for settlement between brethren and the church. But he is showing here that we need to get experience in settling matters right here and now according to the word of God. Now the rest of the dead that were not the dead in Christ — that had not gained their salvation during this life — will not live again until the end of that thousand years. Verse 5. That's what he is speaking of the first resurrection is the resurrection of the dead in Christ. Listen, my friends, where are you going to be when that time comes? Well if you are still living at that time, either you will be changed in a moment in the twinkling of an eye, at the last trump at the second coming of Christ and caught up together with these dead in Christ that are now alive to meet the descending Christ, who is coming again to this earth as He said He would; or else you will remain dead in your grave another thousand years. God set before you life and death and He said choose and you're going to choose. And if you think you don't choose, then you are choosing death automatically. Any way you look at it you are choosing. You are choosing every day. If you neglect so great salvation, you are choosing. But you are making the wrong choice. You can't escape. You can't escape choosing. They are blessed and they are holy. Without holiness none shall see the Lord. But you have to get all that holiness from God; from Christ your high priest. He's there on the throne of grace waiting to give it to you. He has a lot of holiness and He can impart it to you. He is righteous and He can impart His righteousness to you and make you righteous so you can also be righteous. They reign with Christ. He is the King of kings the king over all nations. We will be lesser kings or governors or whatever title is used at the time. Now turn back to Daniel. Daniel's prophecy and I want you to notice what is foretold in your Bible. Daniel the seventh chapter and in the seventeenth and eighteenth verses. Now I haven't time for this entire chapter now. This seventh chapter is the one where Daniel had a dream. It was in the first year of Belshazzar. Daniel had a dream and in his dream he saw four wild animals. And the first was like a lion, the second was like a bear, the third was like a leopard; it had four heads though. And dominion was given to it. It was a government ruling it was only a symbol of a government. Now my friends, this is picturing the world ruling empires, the governments of man over mankind from the time of the prophet Daniel, who lived six hundred years before Christ. Beginning with the Chaldean Empire of King Nebuchadnezzar with its capital city of Babylon; it was often called Babylon after its capital city. On through the Persian Empire which was this second beast like the bear. And then this third beast like a leopard — the beast that had the four heads that was quick and catlike like a leopard. Dominion was given to it — that was another government. You see these beasts or these wild animals are kings. Now when we come to the fourth one the fourth beast is the fourth kingdom that shall arise out of the earth. So we know that king and kingdom is synonymously used here. Then it comes on down to the Roman Empire and even ten divisions after that. Coming down even to something that is rising up over in Europe and in the Middle East even now, my friends, and carrying on to the very time of the second coming of Christ. There's your final great white throne judgment with the Ancient of Days there. "I beheld then because of the voice of the great words which the horn spake: I beheld even till the beast was slain, and his body destroyed, and given to the burning flame" (Daniel 7:11). That beast is the governments of this world now. Course there's a specific identity, but I haven't time to go into that phase of it just now. But I want you to get the point, my friends that the saints of God are going to rule with Christ. He is going to take over the government and He is going to rule with a rod of iron. Jesus Christ has gone to heaven to get for himself a kingdom and to return. And when He comes the dead in Christ will rise first and the living in Christ will be changed and made immortal and they will be given thrones and they will rule with Christ. Again it is pictured as sitting with Him on His throne, well the thrones are the symbols of power and of authority that they will be given. "And the kingdom and dominion, and the greatness of the kingdom under the whole heaven [in other words the rulership of this earth and of all humanity on the earth] ...shall be given to the people of the saints of the most High, whose kingdom is an everlasting kingdom, and all dominions shall serve and obey him" (Daniel 7:27) — who is Christ at His second coming! I tell you my friends it is about time that we wake up to the very purpose for which we were born. We were put here to attain to the resurrection. We were put here to enter the very family of God. We were put here to be trained for positions of rulership, of judging, and of teaching until the earth will be full of the knowledge of the Eternal during the period when Christ comes in that happy World Tomorrow. This is a very unhappy world today and this world is unhappy because men don't know the way of peace. Because they have lost their way — they have lost God's way. God is calling you and me to find his way. TO LEARN THAT WAY — TO STUDY THAT WAY — TO KEEP CLOSE TO HIM — TO GROW IN GRACE AND KNOWLEDGE AS CHRISTIANS. TO OVERCOME OUR OWN SELVES AND TO GET THE TRAINING AND THE WORK THAT GOD HAS GIVEN US TO DO. HE HAS GIVEN US THE JOB OF CARRYING THIS GOSPEL TO ALL THE WORLD AS A WITNESS TO ALL NATIONS.